Homemade chicken noodle soup will simply warm your soup. The secret is to always always make your own home made chicken broth from a whole chicken! I share my grandmother’s broth recipe below! Growing up, I never had homemade chicken noodle soup – not from the can nor from scratch. Russian cuisine is rich in soups so mom and grandmother always had their classics to choose from. I did see my fair share of Campbells soup of the can commercials. But for years I was never tempted to try the canned version or even make it myself. Just recently though my best friend was incredibly sick for her birthday (what poor timing) and knowing how much she loves this soup I figured I’d whip up a batch for her. And since it was her birthday after all, I knew she deserved some home made chicken broth too. There are lots of different recipes for chicken broth but I’m going to share the one passed on to me from mom and grandmother. In college I had a huge pot – easily mistaken for a witch’s cauldron – which came in handy many times when boiling pasta for the 6 of us girls – but unfortunately I didn’t see the need for it anymore and didn’t bring it to DC with me. What a mistake. It would have been perfect for making huge batches of broth – which freeze perfectly by the way. O well I’ll just have to learn to make due with my 5 quart dutch oven. You can make chicken broth with any part of the chicken but I think it’s easiest to buy a whole one, remove the inner parts, chop off some of that icky looking tail fat and throw the whole chicken in the cauldron. And then that tender, soft chicken meat can be used in salads, sandwiches, soup, quesadillas – the possibilities are endless. This time I used most of the meat for the chicken noodle soup. And it was fantastic. I really was missing out all those years. Homemade Chicken noodle soup truly is the perfect comfort food. I wasn’t even sick and still I enjoyed it for breakfast, lunch and dinner. Good thing D doesn’t care for soups so I didn’t have to share much with him. But A, the sickly friend, and I really enjoyed this soup – so much that I made it again the next day too. I know you can bypass all the work here by just buying the canned or boxed version, but trust me, it doesn’t even come close to the real home made one. 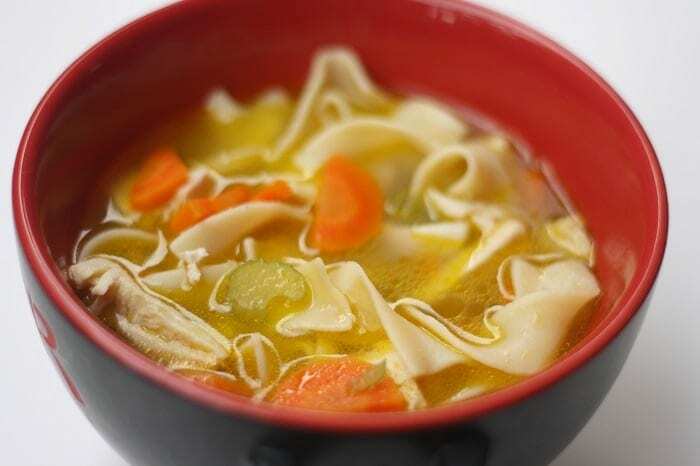 What’s your take on homemade chicken noodle soup? Is it worth all the worth? I say YES! If you’re in the mood for different comforting soup be sure to try my roasted cauliflower soup too! 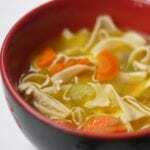 Homemade Chicken Noodle Soup Recipe just in time for the cold fall and winter months. Make your own broth for it to be extra special and delicious. Place chicken in a pot (if pot is too small for whole chicken to be covered with water, chop it into smaller pieces first) and fill the pot up with cold water. Bring to a boil, pour out all the water, fill the pot up again (washing off any residue that has formed on the sides) and bring to a boil again. As soon as water boils the second time, reduce heat to low, add carrot, celery, onion and peppercorns and continue to simmer, uncovered for 1 hour. Using a spoon, occasionally skim off any film that forms on the surface. Add bay leaves, salt and pepper, a few minutes before broth is done. Remove chicken, celery, carrot, onion and bay leaves. Heat vegetable oil over medium heat. Add carrots and celery. Sweat the vegetables for 10 minutes, without letting them brown. Add salt/pepper to taste. Add chicken broth, onion and garlic, and bring to a boil. Once boiling add egg noodles. Reduce heat and cook for 10 minutes. Add shredded chicken, and bay leaves. Cook 5 minutes. Remove onion, garlic and bay leaves. Serve hot! Chicken soup is the best comfort food ever! And it’s that time of year for soup! Looks delicious. This looks gorgeous…I love all those big broad egg noodles. I am delightful that I found your posting because this would be a big help for me to cook a Chicken Noodle Soup. Since I am likely to cook a Chicken Noodle Soup following day. Thanks for this post! I will bookmark your site now to come across again your post.